The 'Come And Get It' singer, who recently ended her on/off relationship with Justin Bieber for good, is reportedly hooking up with the British singer-songwriter after being introduced by their mutual friend Taylor Swift last month. A source told UsMagazine.com: "They are hooking up!" The insider claims the 'Lego House' singer, who previously admitted he "wouldn't complain" if he was set up with the brunette beauty, 20, has been enjoying romantic dates with her recently after Taylor, 23, introduced them over Memorial Day weekend at the end of May. 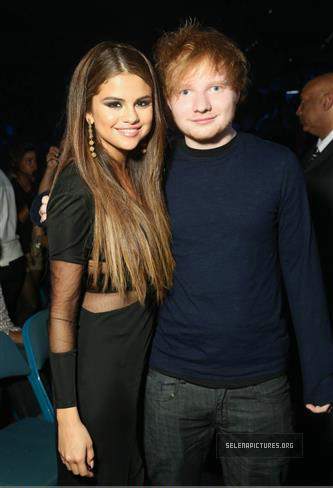 Another insider said that Selena is smitten with Ed because he is much more mature than Justin, 19. The source explained: "She got sick of having to take care of Justin like he was her child. This is a nice escape from the drama. "They are friends with an open mind. He's sensitive and sweet and a lot deeper than Justin." Ed, 22, is currently on tour with Taylor in the U.S.